Food is the first area of action in our ‘5 things we can all start doing right now’ campaign, launched in response to the latest IPCC report in autumn 2018. Food is responsible for a quarter of global carbon emissions, and animal products for over half of those. LCWO promotes the production and consumption of sustainable sources of food, including local food, and in line with IPCC recommendations, is supporting West Oxford residents to seriously reduce or eliminate meat and dairy from their diets. LCWO hosted its first ‘Beet the Waste food & music festival’ at the Tap Social in autumn 2017, as part of our 10 year anniversary celebrations. The event proved very popular, and has since become an annual date on the West Oxford calendar, running for the second time in September 2018. The afternoon is run in partnership with the Oxford Food Bank, Waste2Taste and a range of other local partners, and takes place at the fab Tap Social. As well as tasty food stalls, food bank tours and information galore, there is an annual cake competition (the first year, veg-based, the second year, for best vegan cake), live Ready, Steady, Cook competition with local chefs battling out using ingredients which would have otherwise gone to waste, live music, and of course, delicious beer from Tap Social. The third Beet the Waste is happening on September 29th 2019. See you there?! We recently wrote a letter to our local supermarkets to check up on their progress in reducing their carbon emissions, following our ‘How Green is your supermarket’ event in 2015. We set up a Jam Jar Bank to encourage people to reuse their jam jars and make jams and chutneys. The bank is now housed at Hogacre Common Eco-Park – pop by and help yourself – and whilst you’re there, grab some delicious food at the seasonal caf, open on Sundays through the summer. We have a small collection of seasonal recipes on our website, and also share recipes on the blog and in our monthly newsletters. 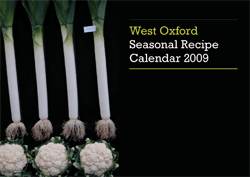 LCWO produced a 2009 awareness-raising calendar featuring pictures of fruit and vegetable from the West Oxford allotments, with seasonal recipes. The photos and recipes were donated by local residents and money raised went towards supporting LCWO local environmental projects. The calendar sold out and made a small profit.